Here is my oil cleanser review. Luckily all 3 of the reviewed products are absolutely amazing and are at three different price points. I like oil cleansers because I don't have time to remove my eye make up separately from my normal cleansing routine. I would rather spend that time slathering on more face cream. I'll start with the best of the lot because I hate anticipation. 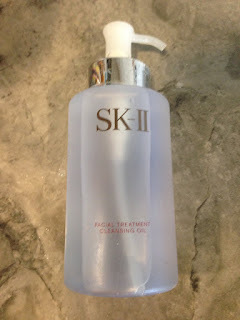 The SK-II facial treatment cleansing oil ($90) is the holy grail of cleansers for me. This stuff is amazing and lasts about 6-7 months. It truly melts away all of my make up with1- 2 pumps and has the added anti aging benefits of my beloved Pitera. No residue no breakouts, amazing skin, no messing around. Saks also has an SK-II gift with purchase right now! The worst I tried was the Shu Uemura Ultimate 8 cleanser $98/15.2oz and Shu Uemura Anti Oxidant $92/15.2oz Cleansing Oils. I really wanted to love this because of all of the amazing reviews and this was the first oil cleanser I have ever tried. I used the Ulitmate 8 on 2 separate occasions for a whole month each time but I found that it made me break out every time. I even tried The Anti Oxidant one in Miami's humid climate versus our dry air here in Alberta and it broke me out for my short stay in Miami as well as when I used it for the remainder of the month back home. The cleansers seemed to clean off all of my eye make up and everything but it seemed that there would be remaining oily residue that caused me to break out. So while looking at other available and cost effective options after I used up all of my SK-II cleanser I discovered the Dior Instant Gentle Cleansing Oil. That's right, Dior is a cost effective option! For all you oily skin ladies fearful of oil technically though this isn't really an oil but it feels like one. This stuff met all of the above criteria and it smells so good! The scent is very light and soft. This is $48.00 for 6.7oz but I have to use about 2-3 pumps to get all of my make up off so the bottle roughly lasts 3-4 months for me. Last but not least in the less than $50 category I got the DHC deep cleansing oil. Of all of the cleansers I tried this one felt the most oily but got all of my make up off. I found it at TnT supermarket on sale for $29 so I bought two bottles it's normally $35. I definitely have to recommend that you use a good toner with this as I found that it left residue. *disclaimer/instructions for using cleansing oils. Always use on dry skin and gently massage into skin. Proceed to rinse with water to produce a white like foam and it washes away like a dream.